Falls can cause physical and financial devastation. It’s critical to assess older adults’ strength, balance, and mobility to determine individual fall risk and implement exercise therapies to prevent decline. Falls are a major health problem in the elderly community, increasing the risk of mortality, morbidity, disability, and frailty.1 Falls are the leading cause of injury among adults over the age of 65, and each year one in three older adults reports having had a fall, according to the Centers for Disease Control and Prevention. So is there a way to meaningfully identify the fall risk of your residents or those older adults living in the community? Is there a way to look at optimal aging and know when someone is transitioning from barely functioning to becoming frail? The answer is yes. It is possible to measure older adults’ fall risk and prevent a downward spiral from barely functioning to frail, thus saving hundreds of thousands of dollars in related medical costs. The key is collecting information that allows an older adult and a practitioner to compare individual results with normative data and use those data to predict future functional and disability status. The objective then is to find markers that predict a clinical decline in the future and proactively do something about it. A closely linked concept to optimal aging is the “slippery slope of aging.”4 A major factor for older adults’ optimal aging centers on physical ability, including strength, mobility, and balance. The sooner healthcare professionals can detect decline or movement down the slope, the sooner they can implement exercise to prevent further decline in an individual who is teetering between the thresholds of function and frailty, which may be a small physiological change but can result in a huge change in independence. Older adults who are physically inactive lose muscle mass and strength more quickly than active individuals who participate in strength training.6 After the age of 60, power decreases even more rapidly at a rate of 3% to 5% annually, affecting the ability to move and react quickly.7 Thus, 60-year-olds who maintain sedentary lifestyles will, at the age of 70, be up to 50% weaker than they were at the age of 60. At Fox Rehabilitation, the Fox Better Living Strength, Mobility, and Balance Exercise Program utilizes three core functional outcome measures, along with an examination of fall history, to assess a resident’s risk of falling. A thorough medical chart review is completed to determine a resident’s comorbidities, medications, and documented falls. The first functional outcome measure helps to determine lower extremity strength. Lower extremity weakness is the highest risk factor in predicting falls.9 Another measure identifies patients who are prone to falls and is a valid method of screening both for functional mobility and fall risk in community-dwelling older adults.1 The last measure is a test of balance. 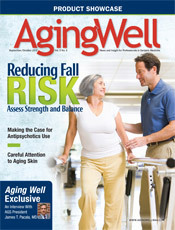 The AGS recommends all older adults undergo routine screening to determine their risk of falls. The Fox Better Living Strength, Mobility, and Balance Exercise Program provides these screenings to all facility residents on an ongoing basis to track changes over time and implement proactive plans of care before a fall occurs or functional deficit develops. Screenings also are performed when a new resident moves into the community, after returning from a hospitalization, at the request of a family or staff member who recognizes a possible change in function, or after a fall. Residents’ scores on the assessments are compared by age and gender with independent-living older adults without a history of falls. Exercise physiologists review the scores with the assisted-living facility’s healthcare team, and an appropriate plan of care is implemented. If a resident scores below the mean for any one test, he or she is determined to be at a high risk of falling. Residents who score above the mean for all tests are determined to be at a low risk of falling. Residents at a high risk of falling are often referred to physical therapy to improve their leg strength, posture, gait, balance, cardiovascular stamina, and transfers; to occupational therapy to improve their arm strength, posture, and dynamic balance and cardiovascular stamina during activities of daily living; and/or to speech therapy if their falls were caused by a lack of safety awareness or cognition deficits. Other recommendations frequently made for residents determined to be at a high risk of falling include a change in toileting schedule, a polypharmacy review, a comprehensive home safety assessment, and an increased level of care to provide more one-on-one supervision. Residents at a low risk of falling do not require skilled therapy intervention. However, these residents, who would typically be advised to continue with their usual physical activity routines to maintain their strength, are enrolled in the Fox Better Living Strength, Mobility, and Balance Exercise Program to increase their activity level so they can maintain an optimal quality of life and level of independence based on the most current evidence in geriatric exercise. The program offers a proactive approach to improving strength, mobility, and balance deficits. A trained exercise physiologist leads older adults through the 12-week program that includes a series of dynamic and progressive exercises. Residents are expected to participate at a moderate intensity level, beginning with a full-body warm-up of passive and active range-of-motion activities. Residents also complete a series of closed-chain exercises, including multitasking and cognitively challenging activities. The program is not reimbursed by Medicare and thus does not increase national healthcare costs. Rather, the program provides a cost savings to Medicare by reducing the incidence of falls and the resultant hospitalizations. Assisted-living communities pay independently for the program, as it is recognized as an invaluable benefit to its residents. Preventing falls is good business practice. It has been estimated by the Assisted Living Federation of America that falls can cost an assisted-living community between $100,000 and $400,000 annually. These costs are associated with the staff resources required to address a fall, such as nursing staff responding to the fall; daily follow-ups after a fall; increased patient services required for the patient, such as transport to and from meals and activities; and decreased income to the facility when the patient is in the hospital or in-patient rehabilitation. The Fox Better Living Strength, Mobility, and Balance Exercise Program enhances the culture of fall prevention in senior living communities by assigning an expert consultant with the responsibility of reducing the incidence of falls. Educating senior living community staff members about the role they can play in reducing the incidence of falls is critical to the program’s success. Every staff member can play a significant role in reducing the incidence of falls, yet many staff members do not recognize their importance in this life-saving endeavor. Housekeeping and maintenance staff are often the first employees to recognize the presence of fall hazards in a patient’s apartment, such as unsecured area rugs, telephone cords across walking areas, wet bathroom floors, or cluttered walking areas. These signs of residents’ decreased safety awareness can often be remedied with an occupational therapy evaluation and a plan of care. Kitchen staff members are often the first to recognize that a resident is having difficulty standing from a chair—a hallmark sign of leg weakness—as he or she may pull up from the table in order to stand. Leg weakness can often be ameliorated with a physical therapy evaluation and a plan of care that includes progressive and dynamic lower extremity strengthening. Nurses’ aides are sometimes the first to recognize that a resident has had an incontinence episode. But does that mean the resident has a new onset of a true bowel or bladder dysfunction? Often the cause of such an episode is due to functional decline in which an elder lacks the leg strength, walking ability, or balance to stand up and get to the toilet in a timely manner. Or an incontinence episode could be a sign of a progressive dementia, whereby an elder forgets where the bathroom is or how to properly use a toilet. These deficits can often be ameliorated with an evaluation and a plan of care for speech therapy for cognitive training as well as occupational and physical therapy. The odds of falling are 45% higher in the presence of any type of urinary incontinence,12 and those with urge incontinence are 34% more likely to fracture a bone during a fall.13 The Fox Better Living Strength, Mobility, and Balance Exercise Program provides an opportunity for the housekeeping and maintenance staff, the kitchen staff, and the nurses’ aides to speak with a trained professional about their observations. The in-house consultant initiates a sequence of events that will help to determine the best plan of action possible to reduce a resident’s risk of falls and promote an improved quality of life. To date, 473 older adults (50 male and 423 female) with an average age of 84.8 have completed the Fox Better Living program. In 2011, there were, on average, 17.57 documented falls per month at each of Fox Rehabilitation’s participating communities. In the first half of 2012, there were, on average, 16.02 documented falls per month. Implementation of the program helped to realize a 9% reduction in falls. In 2011, there were, on average, 2.39 hospitalizations per month per assisted-living facility as a result of a fall. In the first half of 2012, there were, on average, 1.47 hospitalizations per month per facility due to falls. This represents a 38.5% reduction in hospitalizations due to falls. Falling is not a normal part of aging, yet one in three older adults will experience at least one fall per year. The financial toll of falls on the US economy is expected to climb to $55 billion by 2020. The US Preventive Services Task Force has determined that physical therapy and exercise are the most beneficial interventions in preventing older adults’ falls, yet insurance providers are putting restrictions on the amount of outpatient therapy services per year older adults can receive. Clearly, new strategies are needed on how best to prevent falls in the elderly population. The Fox Better Living Strength, Mobility, and Balance Exercise Program offers a proactive solution to reducing falls in the assisted-living population. The program relies on proactive fall risk screening followed by plans of care to address individual needs. Often, costly hospitalizations and services are avoided in favor of dynamic and progressive group exercise classes. — Andre Gomez, PT, DPT, is a physical therapist and director of facility operations at Fox Rehabilitation in Cherry Hill, New Jersey. An alumnus of The Richard Stockton College of New Jersey, he has been a distinguished speaker for the American Physical Therapy Association, the American Assisted Living Nurses Association of New Jersey, and the Shenandoah University physical therapy program in Virginia. — Glenn Sloves, PT, MSPT, is a practicing physical therapist and the Fox Better Living clinical program manager. A graduate of the University of Miami, he has been at Fox Rehabilitation for 10 years. He is an active member of the American Physical Therapy Association and belongs to the oncology and geriatric sections. 1. Shumway-Cook A, Brauer S, Woollacott M. Predicting the probability for falls in community-dwelling older adults using the Timed Up & Go Test. Phys Ther. 2000;80(9):896-903. 2. Englander F, Hodson TJ, Terregrossa RA. Economic dimensions of slip and fall injuries. J Forensic Sci. 1996;41(5):733-746. 3. Brewer K, Ciolek C, Delaune MF, Newton RA, Williams AK. Falls in community dwelling older adults: introduction to the problem. PT Magazine. 2007:38-46. 4. Schwartz RS. Sarcopenia and physical performance in old age: introduction. Muscle Nerve Suppl. 1997;5:S10-12. 5. Guideline for the prevention of falls in older persons. American Geriatrics Society, British Geriatrics Society, and American Academy of Orthopaedic Surgeons Panel on Falls Prevention. J Am Geriatr Soc. 2001;49(5):664-672. 6. Lindele RS, Metter EJ, Lynch NA, et al. Age and gender comparisons of muscle strength in 654 women and men aged 20-93 yr. J Appl Physiol. 1997;83(5):1581-1587. 7. Metter EJ, Conwit R, Tobin J, Fozard JL. Age-associated loss of power and strength in the upper extremities in women and men. J Gerontol A Biol Sci Med Sci. 1997;52(5):B267-276. 8. Ganz DA, Bao Y, Shekelle PG, Rubenstein LZ. Will my patient fall? JAMA. 2007;297(1):77-86. 9. Rikli RE, Jones CJ. Development and validation of a functional fitness test for community-residing older adults. J Aging Phys Activ. 1999;7(2):129-161. 10. The National Blueprint: Increasing Physical Activity Among Adults Aged 50 and Older. American College of Sports Medicine website. http://www.agingblueprint.org/PDFs/Final_Blueprint_Doc.pdf. March 2001. 11. Resnick B. Optimizing physical activity among physically frail and cognitively impaired older adults. Presentation at: Exercise and Physical Activity in Aging Conference; July 2010; Indianapolis, IN. 12. Chiarelli PE, Mackenzie LA, Osmotherly PG. Urinary incontinence is associated with an increase in falls: a systematic review. Aust J Physiother. 2009;55(2):89-95.